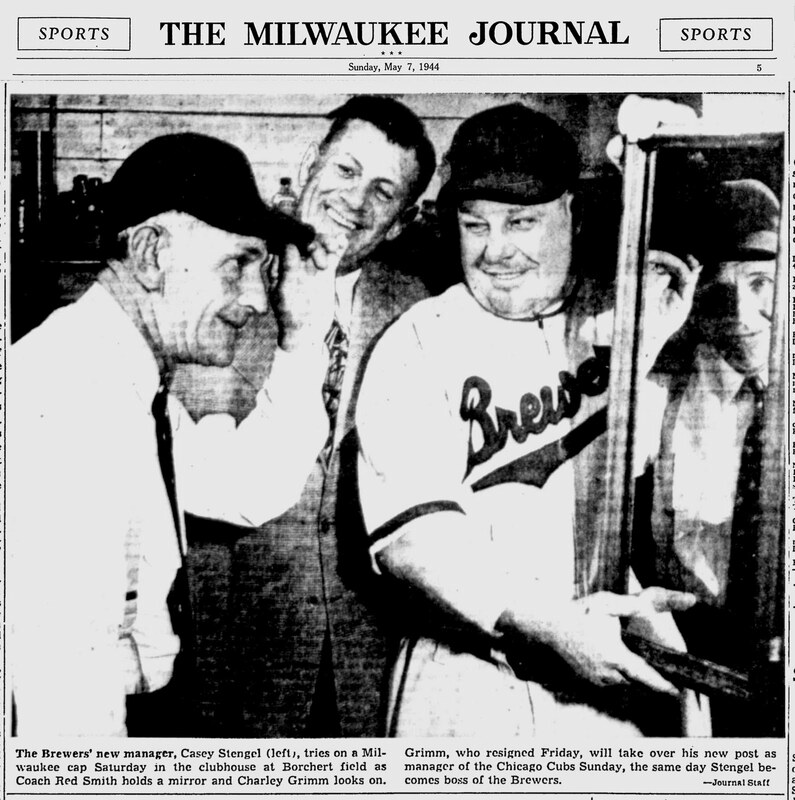 The Brewers' new manager, Casey Stengel (left), tries on a Milwaukee cap Saturday in the clubhouse at Borchert field as Coach Red Smith holds a mirror and Charley Grimm looks on. Grimm, who resigned Friday, will take over his new post as manager of the Chicago Cubs Sunday, the same day Stengel becomes boss of the Brewers. As I said when we first looked at this photo a couple years ago, I love the composition, especially the twinkle in Casey's eye as he dons the Brewers' classic dark blue cap with red "M", looking directly into the lens via the mirror. Not even the dulling effect of newspaper reproduction — and cheap computer scanning decades after that — can dim the twinkle in the Perfessor's eye. His famous sense of humor shines through. Original copies of press photos surface from time to time. This one's right at the top of my wish list.